National Theatre head honcho Rufus Norris has endured an occasionally ‘difficult’ relationship with elements of the nation’s press. But it was nothing but slaps on the back from the likes of The Times and the Evening Standard after RuNo recently, valiantly stepped into the breach , script in hand, after the lead actor Richard Harrington had to abruptly withdraw from the NT’s Home, I’m Darling. While it would be daft to suggest that actors falling ill and being replaced is a ‘trend’, it’s also fair to say that in 2018, it seems to have hit the news a lot. To raise the two most famous examples: back in June, 42nd Street understudy Steph Parry was called at the last minute to step into the lead… of Mamma Mia! , which desperately needed somebody. Later on, over the summer, the PR for the preposterous soft rock musical Knights of the Rose at the Arts Theatre sent an almost daily update on Jennifer Caldwell, the member of the theatre’s bar staff who stepped in to understudy a role and ended up joining the cast. Does this mean anything bar a few lucky escapes for shows? I mean, yes and no. 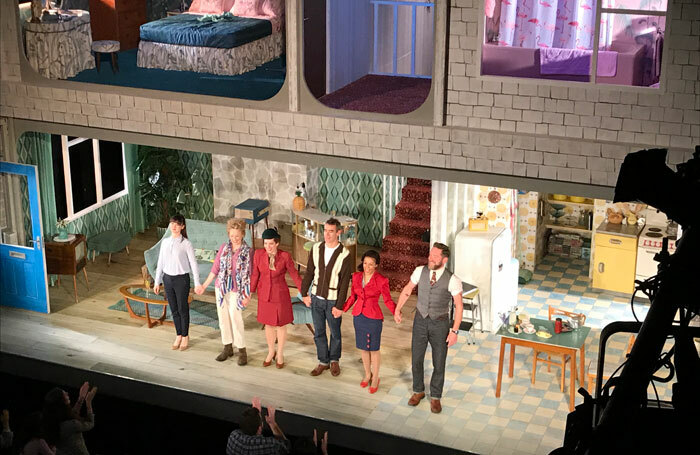 I don’t want to take anything away from RuNo, who undoubtedly did a wonderful thing for his cast , but it’s difficult to think the NT marketing machine didn’t know what it was doing when it tweeted out a photo of a grinning, artistic director-enhanced cast just before they took to the stage. Knights of the Rose, in particular, was really in the market for some non-toxic press following its initial reviews. The news that Caldwell had stepped into the breach  was picked up as far as the BBC, which hadn’t previously mentioned the show before, and didn’t allude to the stinging reviews in its story. The brutal truth of the matter is that 99.99% of what theatre people think is significant about theatre bypasses the general public almost entirely. However, Brits almost obsessively love an underdog, and thus stories about understudies  and – even better – non-understudies saving the day have massive cut though, at least on a par with that other great theatre chestnut: ‘mobile phone rings in theatre and celebrity tells them off’ . Inevitably, these stories seek to play down the actual qualifications of the saviours to enhance the fairytale nature of the narrative – Caldwell may have been working in a bar between jobs, but she had numerous West End credits to her name; Norris trained at RADA; Parry was called upon because she’d performed the lead role in Mamma Mia! before. All headlines about understudies usually patronise their subjects a little – really the story usually amounts to ‘trained actor acts’. Is this all just harmless fun? I mean yes, much as I pray we have now reached Peak Understudy, in a sense it absolutely is. But, at the same time, I do think it’s sobering to reflect that what to a reader of The Stage probably reads like diversionary frivolity – often clearly shaped by marketing departments – is the closest theatre has come since Hamilton to penetrating the mainstream national discourse. More important arguments over diversity, access, gender, the canon, etcetera etcetera that we constantly find ourselves agonising over – or even the simpler question of what the current crop of plays are and whether they’re any cop or not – are largely invisible to non-theatre regulars. I don’t necessarily think this is a bad or unreasonable thing, just a slightly humbling one, and being humble is generally not a bad idea. Maybe theatre is the absolute frontline battlefield for the future of all culture, but maybe it’s not. Perhaps, it would be healthier to view it as an underdog artform.